In this episode of Climate Stew we travel to the Arizona desert to hear about how one woman with her friends are meeting the needs of migrants in need of humanitarian aid. We also consider the Paris Accord as Marvin Bloom breaks it down for us. Was it a successful summit? Will there be a substantial change as a result? And what did the Bloom family finally buy for the grandparents 75th Wedding Anniversary?? 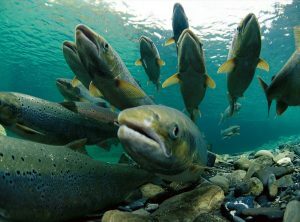 The folks at Yale Climate Connections also tell us about changes in salmon production on a changing planet. And in our main section we have special music with the permission of the musician Moby. Climate Stew is available on iTunes, Stitcher, SoundCloud, or Listen here on our site. Also check out our Facebook page where you can give your ideas of what you want to hear on the program. Welcome to episode 42 of Climate Stew, the audio magazine that takes an offbeat view of climate change. I am Peterson Toscano. 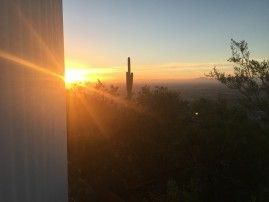 Last month I spoke with Deborah McCullough, an artist and humanitarian who has been bringing well-needed supplies to migrants in the Arizona desert. I share with my interview with her. Also, Mavin Bloom weighs in on the historic Paris Accord. He somehow connects it to a Bloom family fiasco. You’ll see. 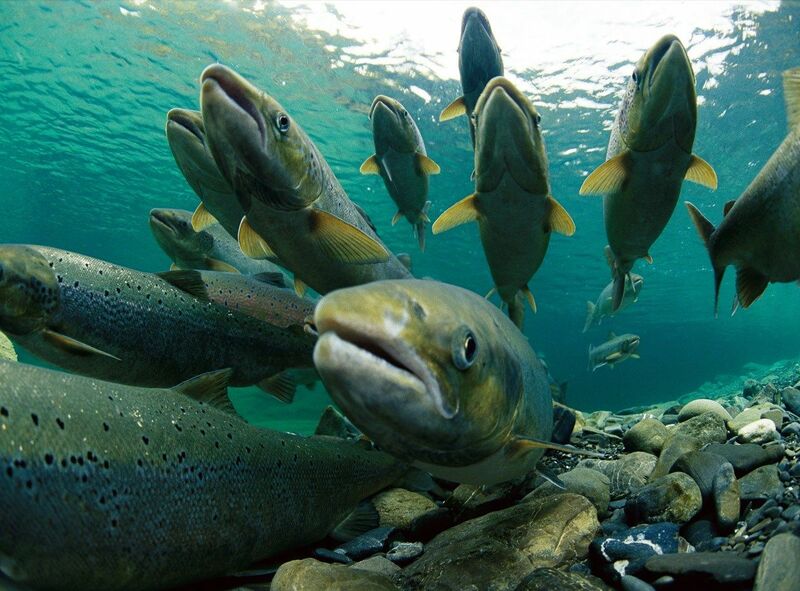 But first, Dr. Anthony Leiserowitz reveals to us what is going on with salmon production. Ah Salmon, back in October when I was in Tromsø, Norway, each morning the hotel staff put out mounds of smoked salmon as part of the massive breakfast buffet. I thought of my in-laws in South Africa, where salmon is an expensive import. They would have gone mad. From Norway I headed to Texas, Arizona, and New Mexico, and dived into another culinary and cultural experience altogether. I also faced an immigration check point on the highway as I entered New Mexico from Texas. The boarder patrol guard asked if I was a citizen. I still had Norwegian on my mind. I was so tempted to respond. Jeg er en skuespiller og performancekunstner. Jeg snaker ikke engelsk. Instead in my best American accent, I replied, Yeah, I’m American. I then headed to Arizona where I had the extraordinary opportunity to be in Tucson, on a very special day. For 15 months Rosa Robles Loreto lived in the Southside Presbyterian Church. Back in 2014 the US immigration service informed Rosa that she must leave immediately and return to her birth country of Mexico. Without legal documentation to stay in the US Rosa faced the grim reality that she had to leave her two sons and her husband in the USA or else move the whole family to Mexico. But her children, ages 8 and 11 at the time, are American citizens and only ever lived in the USA. Rosa found sanctuary at Southside Presbyterian Church. She believed she would only stay a week while Margo Cowan, an immigration lawyer with over 40 years experience, reasoned with the US government. But the immigration officials were unmoved and weeks turned into months. 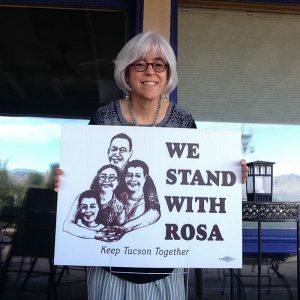 Thousands of people heard about Rosa’s plight and stood in solidarity with her and her family, placing signs on their lawns—I Stand with Rosa, and lobbying the government. 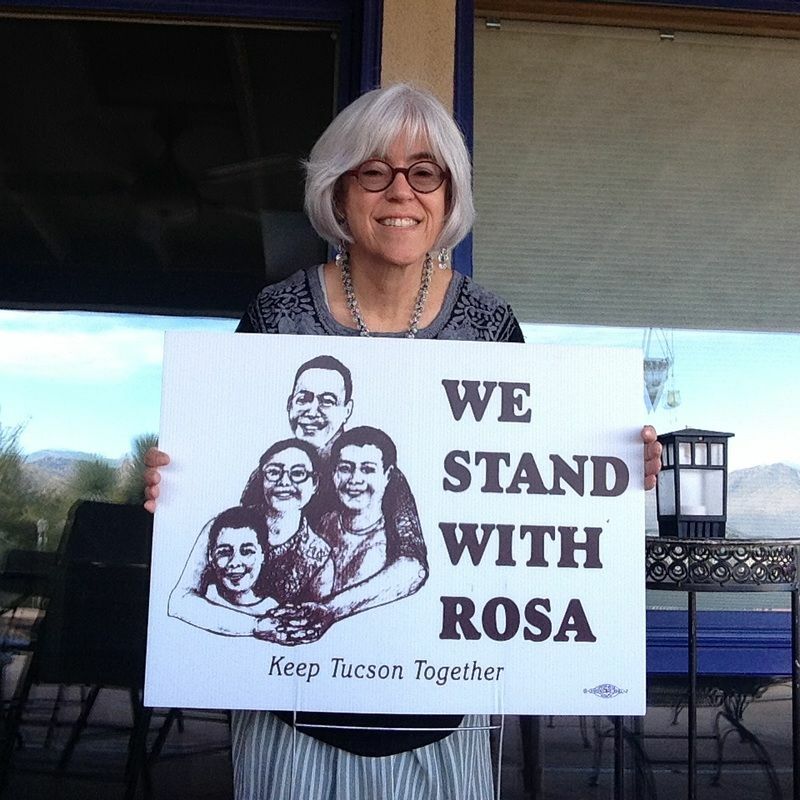 I happened to be in Tucson the day Rosa finally left Southside Presbyterian church. It was a huge event with over 200 people packing the small church and dozens of journalists, local and national, covering the story. But before the doors opened as I waited outside I met some of the people who for 15 months were standing with Rosa. Deborah McCullough spoke with me about her work with migrants and refugees who face extreme conditions as they enter the US from the Mexican border. What role can someone take when she sees people suffer? 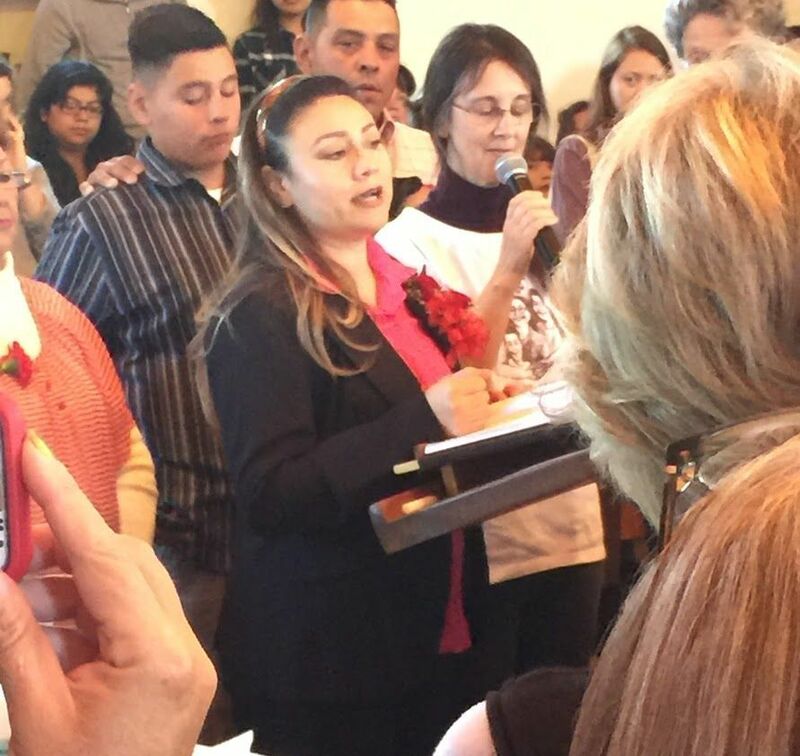 With multiple waves of immigrants seeking refuge, Deborah took notice, informed herself, and decided she needed to do something. She responded both as a humanitarian and as an artist. 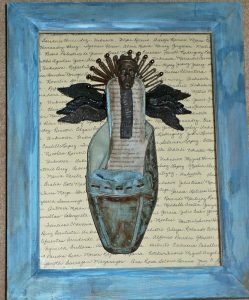 A six winged angel holds the highest place in heaven. Using a woman’s shoe found along the migrant trail along with a hair clasp I created this shadow box. The background is made from names of people, both named and unnamed, who died in the Arizona desert. This angel with a crown made from a tuna can wears a belt also made from a tuna can carried by a desert traveler bearing the words La Lucha Sigue: The Struggle Continues; in her hand she carries an aluminum foil cross found in the branches of a tree which had sheltered a traveler from the hot sun. 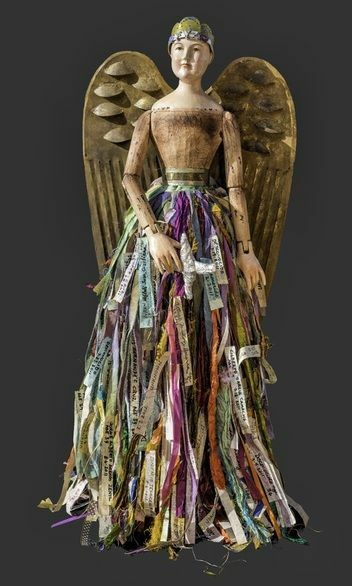 Her skirt is made up of ribbons with the names of those who died in the desert in 2012-2013. For ten years I have walked the migrant trails, collected items and contemplated opportunities to bring items together in such a way to convey a sense of dignity of those who walked the trails and a respect for the sacrifice and suffering they endured. 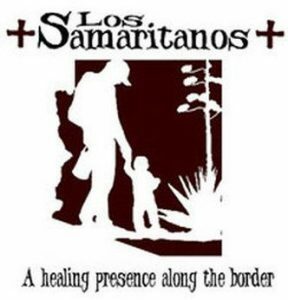 As an artist working in this field, I believe it is essential to my message and to my artwork for me to go into the desert often, to walk the trails and be active in the Tucson Samaritans who go into the desert daily looking for travelers who are lost or have been left behind. Over the years I’ve continued to study Spanish and traveled to Mexico, Guatemala, El Salvador and Colombia, learning all I can about the issues that lead people to decide they must move North. Hi this is Marvin, Marvin Bloom, and this is your moment with Marvin! This holiday season climate activists got the perfect gift, The Paris Accord. In early December representatives from almost every country in the world went to Paris and agreed to do something to address global warming. I seriously didn’t believe they were going to pull it off. I thought this is gonna be Grandma and Grandpa Bloom’s 75th wedding anniversary all over again. What a mess that was. You had four of their living children, the grandchildren, everyone’s spouses, a seance to check in with a deceased sibling, plus a few ex-spouses, all trying to agree on the perfect gift. You had the really rich relatives in the Hamptons, the well to do ones in Huntington Long Island and in Florida, and the other ones somewhere in Queens all getting a vote. It was my Uncle Leonard’s bright idea that we all had to agree on a gift. Being the owner of the banquet hall and catering company, whenever there is a family party, Uncle Leonard always gets his way. He’s like the Ban Ki-moon of the Bloom Family. And that’s what it was like in Paris except for one big difference. No, they had kosher food in the big climate summit. They also had vegan meals, halal meats, and a constant Costa Rican coffee IV drip for Christiana Figures. 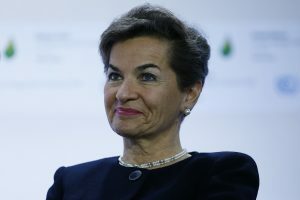 She’s the UN Climate chief. I imagine she didn’t sleep for 276 consecutive days leading up to the the historic climate agreement. No unlike the gift fiasco of the Bloom 75th Anniversary, the 195 nations at the UN meeting in Paris did NOT have to all agree on giving the same thing. Instead they each pledged to their own individual plan to reduce their fossil fuel pollution and to promote energy conservation. They each brought their own gift to the table. Of course there is nothing forcing these nations to act on their climate promises. The organizers of the conference and pretty much everyone else admits more has to be committed and done to actually keep the planet from warming above the magic 2 degrees Celius limit. Still it’s a start. Now it is up to the big countries—the US, China, the EU, India, and Russia to put policies in place that will kickstart an international energy revolution. Much like Aunt Myrna and Aunt Sylvia did when they threatened to bring their entire bridge club dressed as mermaids to the 75th anniversary party if we didn’t all agree on a gift. Lots of people are now talking seriously about a carbon tax. You hear Peterson harp on it all the time. But we do need to find a way to add incentives to create new energy supplies and reduce pollution. Raising the price of the harmful stuff—fossil fuels, will no doubt help. In the end what did we agree on to give my grandparents for their 75th Wedding Anniversary? It was my stupid cousin Jason’s idea. The family thinks he’s some sort of hero because he was in the Peace Corps and now he is a rabbi. He’s all save the world. Jason somehow convinced everyone we should all chip in to give our grandparents an ark, You know like Noah’s Ark? , actually 15 of them. There’s this charity called the Heifer or Woofer Project or something. Everyone in the family gave what we could afford. We collected $75,000 to supply15 backwater villages in Vietnam with livestock. The villages got two of each: water buffalos, cows, sheep, goats plus a bunch of bees, chicks, rabbits, and who knows what else. It took weeks for my father to convince my grandparents that they weren’t going to get farm animals dumped on them. I know it was nice for the villagers in Vietnam. 10 years later I bet they still benefit from that gift. Some gifts are like that. Let’s hope the Paris Accord and all the promised gifts to mother earth also have positive ripple effects for lasting change. Thank you Marvin. See I thank you. And thank you for listening to this episode of Climate Stew. In 2016 I look forward to offering you more news, views, and creative approaches to climate action. Please make it a New Year goal to tell three friends about the Climate Stew Show. Share an audio clip of your favorite section. Just go to SoundCloud.com and search for Climate Stew. 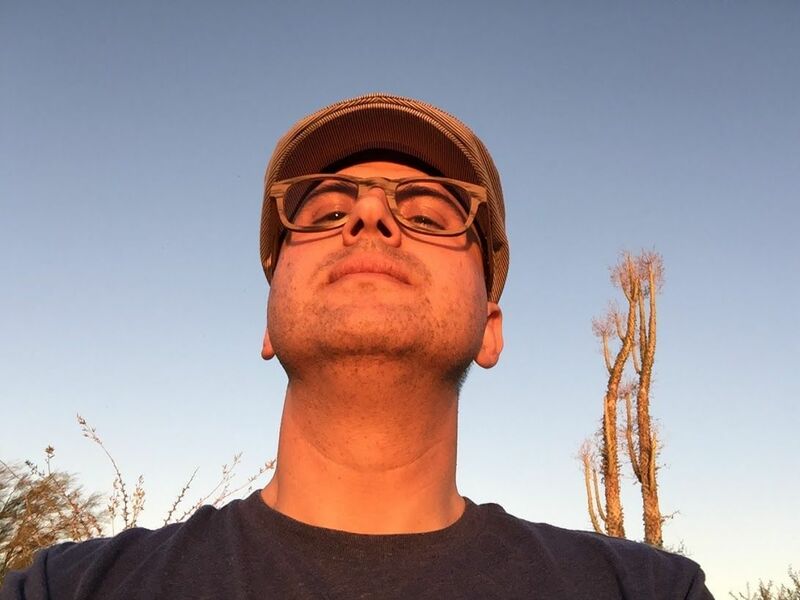 Visit climate stew dot com for a transcript for much of today’s show, lots of links, and music credits. Special thanks to Deborah McCollough, Gretchen Reinholdt, Oh, and Joe G who in 2007 gave himself as a gift to a small village in Indonesia but got returned with postage due. Thanks for listening and Happy New Year!